Richard Rennison was a saddler from Northumberland, who came to Gretna Green in 1926 after hearing that there was a vacancy for a resident 'priest' at the Blacksmith Shop. He was dark-haired with a ruddy complexion, rather stout and of average height. He started "marrying the folk" as he called it, almost immediately. A showman with the gift of the gab, he had the right knack for the job. Rennison was once asked what hours he kept, to which he replied "Doctor's hours". Like other Gretna Green Anvil Priests before him, Rennison carried on the tradition of Gretna Green Anvil weddings and was ready to answer a marriage call at any hour of the day or night. Many a time there was a knock on his door in the early hours of the morning. He would quickly go to the village for his two witnesses and marry the anxious couple there and then before putting the couple to bed and going to bed himself. If the parents in hot pursuit later arrived, he would deny having seen the elopers. He enjoyed and was proud of "his marrying trade". A great storyteller, one of his favourite tales was how, after attending a funeral on New Year's Day in 1931, he arrived back at the cottage adjacent to the forge to find eight couples on his doorstep waiting to be married! Practising his marriage trade at a time when the Church and Establishment were trying to shut it down, Rennison liked to point out that his name, when written in reverse, spelt "No Sinner"! 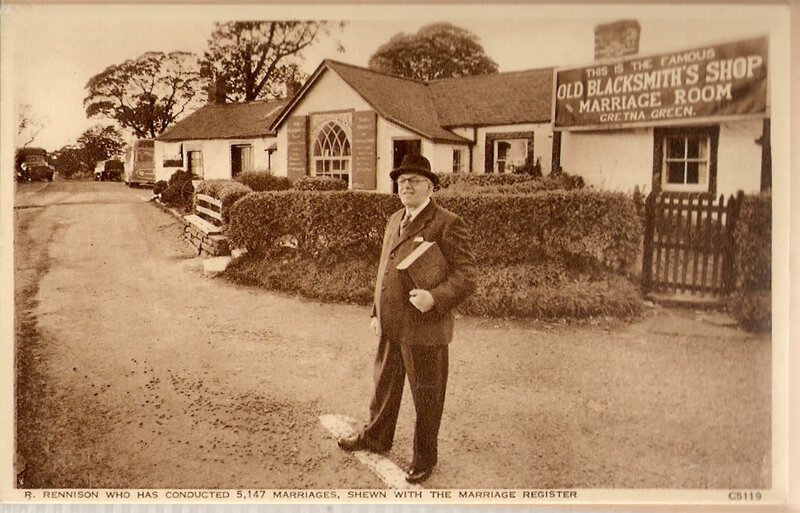 Like his predecessors, he lived in the cottage and by the time the law was changed in 1940 he had conducted 5,147 marriages. He continued to work in the Blacksmiths Shop until 1962 when he retired. Proclaiming herself the "original priestess", Granny Graham was one of the local characters who tried to make a bob or two out of the marriage trade before it was made illegal in 1940. 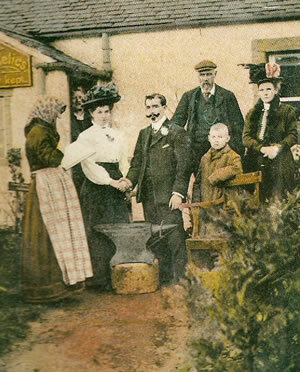 Working in the 1930's, Granny Graham conducted marriages in private houses around Gretna Green. She was said to look "like a typical granny, a smallish old body, dressed in black".